I have been fearful of molecular biology for most of my life. This is partially because I so clearly defined myself as an ecologist that I partitioned molecules into “little biology” and out of my range. But mostly it was a fear of what I considered unnatural. Scientists who play around with chemicals and little tubes of liquid DNA cannot be real biologists, as they are studying life in a tube and not as it truly exists. These actions seemed so separate from what I considered “real biology,” these little details so far from actual application to learning about life as we know it. And now look at me. I spend my days playing with chemicals and little tubes of DNA. I HAVE BECOME WHAT I FEAR MOST. But I’ve been learning that molecular biology isn’t all boring. Molecules can be COOL and some of the little processes really interesting and relevant on a larger scale. One of my favorite small-scale processes is apoptosis, or programmed cell death. For a long time, I never really thought about what the body does with old or sick cells. When your cells get old, you just die, right? Not exactly. The body can destroy and reabsorb its sick cells — incredible! That the body would kill off parts of itself! Maybe this isn’t so amazing to most, but it was a pretty big revelation to me. Apoptosis is also important in development. We start off as one cell which becomes a ball of cells. In order to create cavities, such as the digestive tract, the cells go through apoptosis and creates functional holes in itself. Apoptosis is especially relevant to cancer regulation. When a cell is dividing and, inevitably, accidentally mutating its DNA (see my DNA primer for basics), there are processes that essentially spellcheck the DNA to ensure that it is functional. If there is a mutation that the cell cannot fix, it will send out DNA damage signals to neighboring cells, signaling that it’s time for this cell to die, or it could become cancerous. Additionally, most cancers actually disable apoptosis. That is, they disable the signals so that the body cannot recognize the cell as cancer and force it through apoptosis. As you can imagine, the study of apoptosis has all kinds of implications for cancer treatments. If we could find a way to induce apoptosis in cancerous cells, we could potentially force cancer cells to kill themselves. Scientists from the University of Western Ontario just published a paper online on December 8th in Molecular Cancer Research identifying a protein that activates apoptotic pathways in DNA damaged cells (doi:10.1158/1541-7786.MCR-09-0098). RanBPM, or Ran-binding protein M, had a previously unknown function. They discovered it’s potential for apoptosis regulation in a large screen looking for proteins that bind with Oct-1, a transcription factor implicated in cell survival after DNA damage, and decided to look further. The authors stained cells with DAPI, which is a fluorescent molecule that attaches to DNA and RNA to make it fluoresce under a microscope. The apoptotic cells are condensed and marked with arrows. The right panels show the same image stained with RanBPM-specific fluorescent staining. The apoptotic cells express RanBPM! One problem in studying molecular biology is that living tissue doesn’t take well to being cultured in the lab, so biologists often have to use certain cells types that will grow under laboratory conditions. Where I work, we use yeast, which is beneficial because it is easy to take care of and grow, cheap, and easy to manipulate because it is a simple, single-celled fungus; the downside is that it is not human. The authors here used Hela cells, which are derived from human cervical cancer, and are essentially immortal. These have the benefit of being actual human cells — but they have been described jokingly as their own species because of their immortality, ability to thrive under laboratory conditions, and their abnormal chromosome number (caused by contamination from an HPV virus). However, they are still a good starting point for studying human biology because they are human derived, if a little mutated. The first two steps in molecular biology are usuallyto overexpress the molecule, and underexpress the molecule. The researchers inserted an extra copy of the RanBPM gene into the cells, causing them to make twice as much RanBPM protein. These cells did not survive well compared to normal cells, indicating a potential link with apoptosis. Now they had to double check that this was actually due to a cellular pathway, and not because too much RanBPM poisons cells and kills them, known as necrosis. Caspase 3 is an enzyme commonly associated with apoptosis; the authors then looked at caspase 3 levels in RanBPM overexpressed cells compared to normal cells, and saw a dramatic increase in caspase 3 activation, showing that it is related to apoptosis and not necrosis. So now we know what happens when we have too much RanBPM in a cell. What happens when we have too little? To downregulate RanBPM, the authors used siRNA, or small interfering RNAs. (Read my Protein Synthesis Basics primer to learn about RNA.) These siRNAs have a complementary sequence to the RNA used to produce RanBPM protein. When they are released into the cell, these siRNAs bind with the RanBPM RNA, making it double-stranded and unable to be made into protein, blocking its production. The authors did several experiments where they damaged cell DNA on purpose by radiating it and observed how the cells survived. 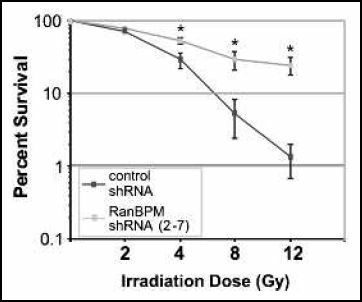 In the image to the right, you can see that cell survival in downregulated RanBPMcells is greater than controls (injected with a random shRNA, a kind of siRNA, to ensure that the shRNA process doesn’t affect the cells’ survival) even with high radiation levels. This demonstrates that a loss of RanBPM protein affects the ability of a cell to undergo apoptosis when it is affected by DNA damage, further implicating this molecule in being important to this pathway. The next step, after over- and underexpressing a gene, is to work out it’s molecular function. The authors looked at the expression of two proteins known to be involved in apoptosis, Bax and Bcl2. When there is a DNA damage signal present, Bax relocates to the mitochondria to do its part in apoptosis. The authors found that in the shRNA RanBPM cells, with reduced apoptosis, Bax never relocated to the mitochondria after radiation, showing that RanBPM affects the Bax pathway. They then looked at another protein which regulates Bax, Bcl2, and also found increased expression in shRNA RanBPM cells. Previous studies have shown that Blc2 overexpression blocks the apoptotic pathway, and can even lead to cancer. When they reintroduced RanBPM to nearly wild-type levels, Bcl2 expression decreased. 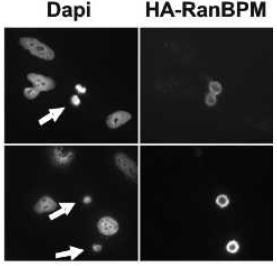 These studies show that RanBPM is in fact affecting the expression of other proteins involved in apoptosis, and a known relevant apoptotic pathway at that. This study, and many molecular biology studies, rely heavily on correlation. That is, looking at changed levels without showing causation. We know now that RanBPM is part of this pathway and affects other molecules, but it still isn’t clear how it affects these other molecules and how it functions in a wild-type cell. If only we could simply use the methods the authors used to overexpress or underexpress these proteins in cancer cells, but regular human cells don’t accept these kinds of treatments. While doing this sort of research is important to pinpoint particular molecules that regulate cell survival, until we have developed treatments to actually utilize proteins in human therapy, we won’t be able to cure cancer.